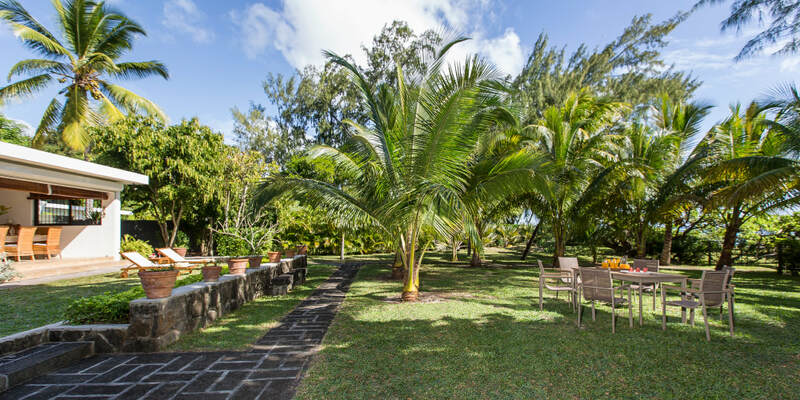 A family house in a peaceful tropical garden, located on Trou Aux Biches’ well known lagoon with its crystal clear water. - A living room which opens on a verandah facing the garden and the sea. - A large outdoor verandah, ideal for dining and entertaining. 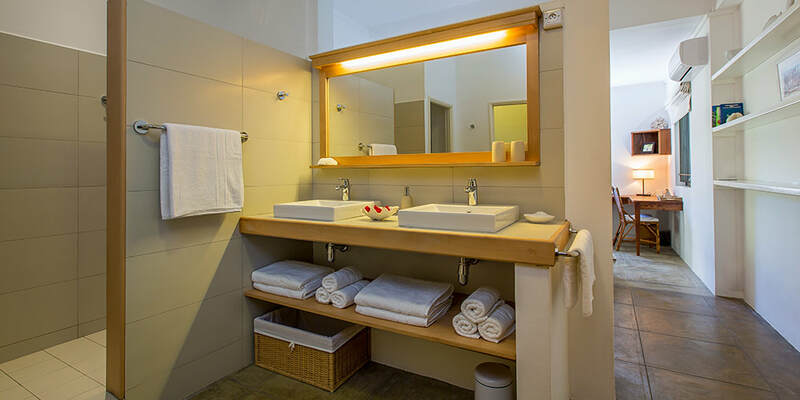 - Four air-conditioned bedrooms, each with its own ensuite bathroom. 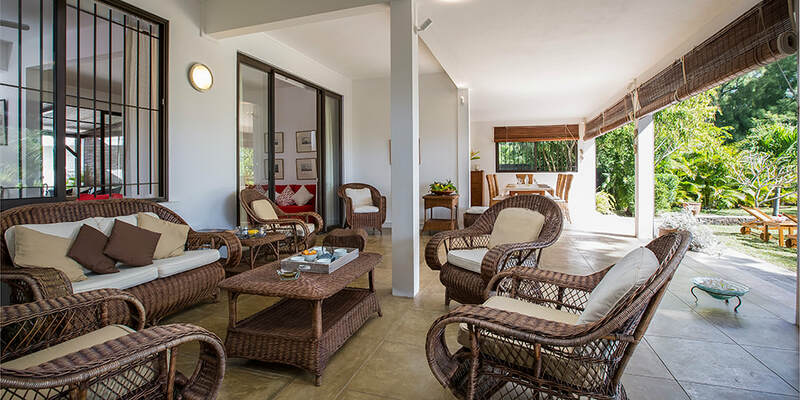 Surroundings: the house is located on our family's premises and next to five stars beachside resorts. ​Small children: all baby furniture is provided at no extra cost: baby cot with linen, car seat, high chair, children table and armchairs . At your disposal: library with English, French and Mauritian literature for adults and children. Board games . 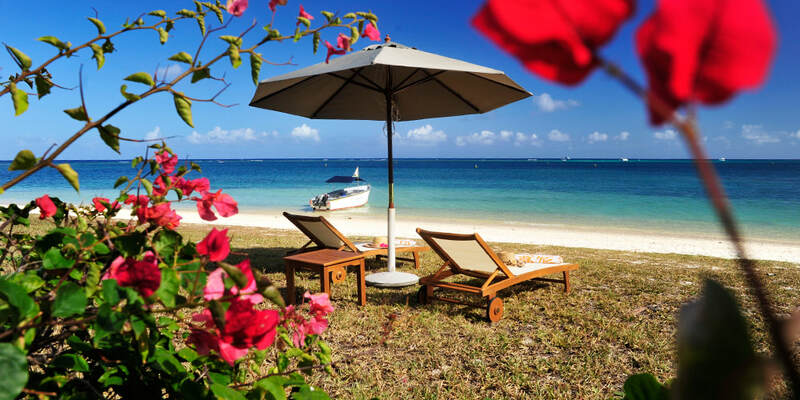 The reef-protected lagoon allows your family to enjoy the sea in total safety. All marine activities (aquatic sports, diving and big-game fishing…….) are available at a close range. 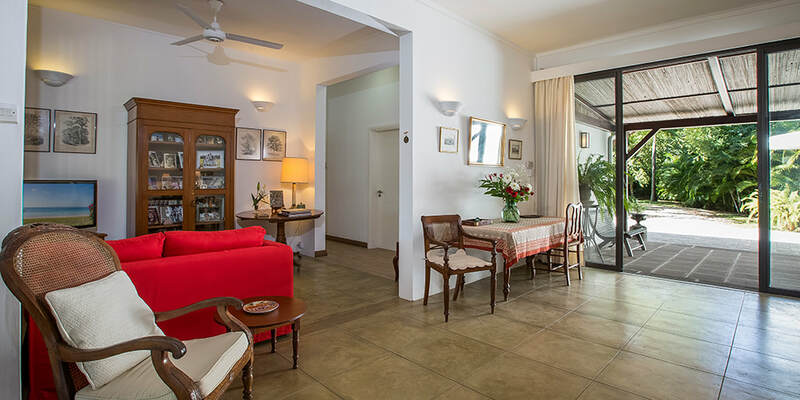 Two bedrooms have king-size beds and view on the front garden and lagoon. Each of the other two bedrooms has twin beds (which can be combined as double beds) and views on the garden. One of the twin bedrooms with its en suite bathroom is designed to accomodate guests in wheel- chair . There is a large parking space next to the main entrance of the villa. Our staff will welcome you and make you feel at home. The maid works six days a week and takes care of house cleaning and clothes. A cook is available ( free of charge or as option depending on the number of guests ) and help you discover the local exotic food. Close to: shops, restaurants, transports, SPA, Beauty Parlour, Health Care Center,Clinic, Pharmacy, Police Station, Post Office, ATM , Catholic Church, Healthcare Centre opened 24/7 in close proximity, taxis stands within a 1/ 5 minute walk, shops and supermarket within a 5/10 minutes drive from the property. 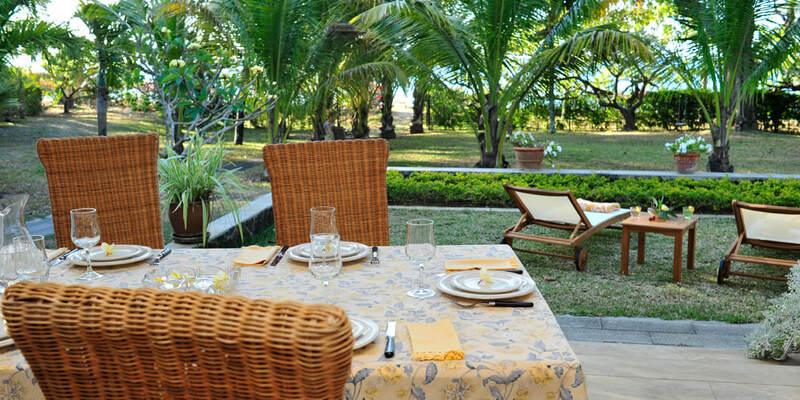 Located 6 km from Grand Baie (the Island’s main city in the North) and 15 km from Port Louis (Mauritius’ capital city). 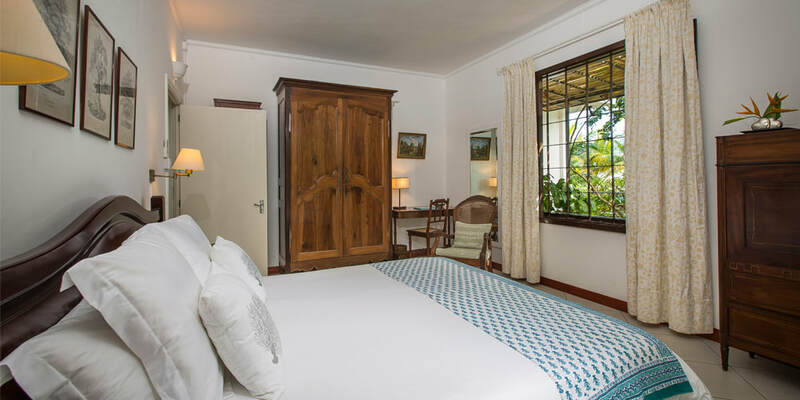 Master bedroom 1: garden and sea facing, 20 m2, double bed 190 x 200 , double wardrobe , ensuite bathroom with two wash basins and large shower, separate toilet. 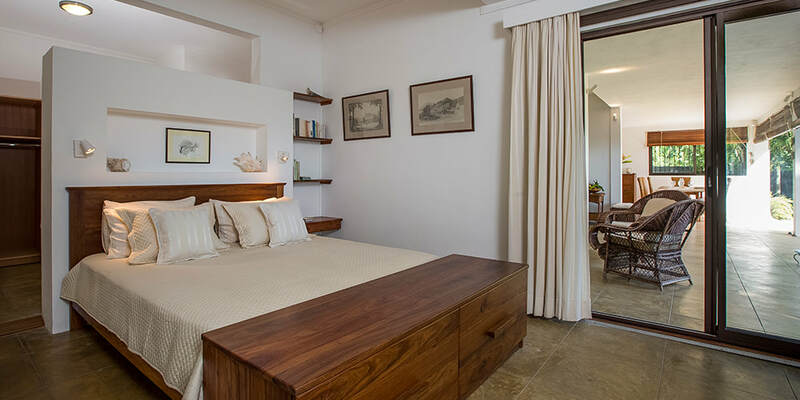 Master bedroom 2: garden and sea facing 18 m2, double bed 190 x 200, double wardrobe, ensuite bathroom with two wash basins , bath, shower and toilet. Twin bedroom 3: accessible to wheel chairs, garden facing, 17m2 , 2 single beds 95 x 200, double wardrobe, en suite bathroom with two wash basins and toilet. Twin bedroom 4: children bedroom, garden facing, 15 m2, 2 single beds 80 x 190, double wardrobe, ensuite bathroom with one wash basin and toilet. Hair dryers available, bath and beach towels supplied. Health Care Centre, Clinic, Bank, Money Changers, Super Market , Post Office, Police Station, Taxi Stand, SPA etc …. 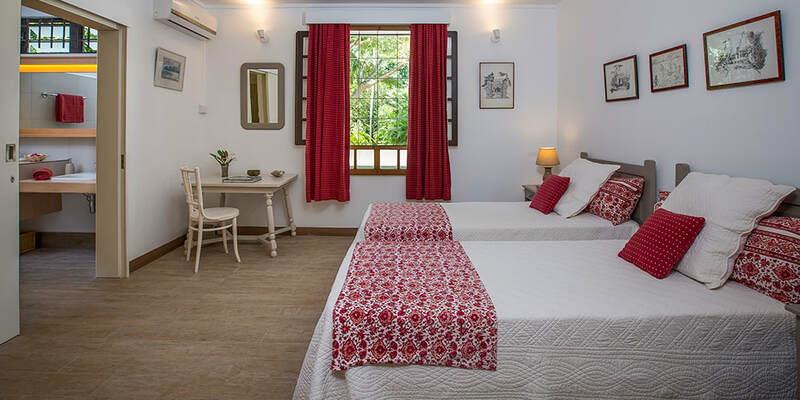 Stella Maris Villa is ideally located and equipped for those willing to spend their holidays with family and/or friends in a private beach villa in the middle of a beautiful tropical garden . The beach and all water sports are available in close proximity of the villa in a place protected from the trade winds and safe for children. Yet, from your holiday villa, shopping centres, restaurants, spas, ATMs, Post Office, banks etc... are available within minutes saving you precious beach time.